I spent most of May 2015 in Scotland with my wife, Rochelle. We spent several weeks on the Isle of Skye in small cottages, going out for hikes when the weather permitted (and hunkering down during the blustery gray days). The most memorable hike of all was a long trek through two ruined villages, Boreraig and Suisnish. I brought my camera; here's what I saw. The hike starts at Cill Chriosd, a ruined church closed in 1840. It is overrun with sheep. It's also surrounded by a graveyard. Plants are taking over everywhere. A plastic-coated booklet tucked between some rocks. View from inside the church. A grove of trees still stands by this monument. There are several plaques like this. The cemetery is populated with war dead. Leaving the church, we faced a mountain range. It would be a long day. Although most of the land is covered in scrub, a few trees thrive. This one is surrounded by some ruins. One of the many, many waterfalls along the way. On the way to Boreraig is an abandoned quarry. This is part of it. Keep an eye out for these rocks later. The remains of a winding wheel; it pulled trains up the steep incline we had just ascended, in order to fill them with quarried stone. From a small hill, I saw this ruined house in the distance. This was taken using a very big zoom lens. We called these "Star Trek rocks." They look like polystyrene rocks you'd see on an alien planet. I checked; they're real. Approaching Boreraig, there are some ruined stone houses (lower right) barely visible. This is Loch Eishort. The first one we encountered, up close. Many of the houses were missing walls, all had long ago lost their roofs. 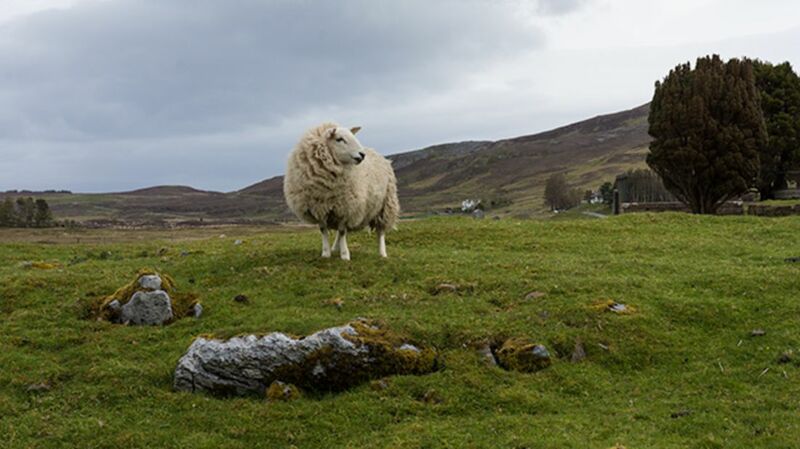 The village was forcibly cleared in 1853 by Lord Macdonald, who preferred to use the land for sheep. He burned the houses. Inside a house, storage cubby holes are still intact. Plants are taking over. In the background, another hut. In this structure, the wall facing the water is almost completely gone. This was one of the bigger huts; many of them were 60 square feet at most. Someone has propped up a stone over the former doorway. Virtually all the doorways are intact as openings, but missing their top stones. This is the view residents of Boreraig had. A sheep shown for scale. The walls are very low; standing inside a house, I was head and shoulders above the walls. Presumably the roof would have made these considerably taller and more livable. I noticed that there isn't any mortar in these rock walls. They're just carefully laid. Detail of a rock wall. Rochelle stands inside one of the largest structures. Heading away from Boreraig, we approached the coast. Throughout the hike we had to ford small streams; this one had a beautiful stone crossing. The best we got on the rest was a half-broken piece of wood, or a few strategically placed stones (that were often an inch underwater). Boots were very necessary. We started walking up the coast. We'd have to go halfway up and around this mountain. There were a few more ruined buildings down by the water. This one still had a window intact. Looking in another window, we see some trash. Plastic washes up on the beach. Somebody decided to put this bucket inside a house. Amidst the rocks on the beach, some blue and yellow plastic. The sheep had no problem navigating rock-strewn beaches. We stuck to grassy areas and paths (often muddy). Rochelle takes a picture as we begin the ascent. Next up: Part 2, featuring insane photographs of the sky over Skye, as the sun comes out and we encounter hundreds more sheep!